1. Preheat the oven to 200°C, gas mark 6. 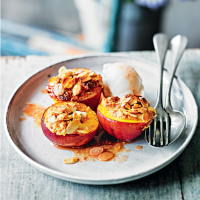 Place the nectarines in a single layer in a shallow roasting tin cut-side up. 2. Place the ratafia biscuits in a food processor and blitz to give coarse crumbs. Alternatively, place in a plastic bag and seal, then crush with a rolling pin. Mix well in a bowl with the butter, ground almonds, sugar and egg. 3. Spoon the mixture into the cavity of the nectarines, piling high, and then scatter the flaked almonds over the top. Pour the Marsala into the bottom of the tin with the orange juice. 4. Bake, uncovered, for 20 minutes until the filling is golden and crunchy and the nectarines are tender. Serve warm with the juices spooned over with scoops of vanilla ice cream.